A war must be waged in Brazil so as to overcome the embedded conservatism of educational institutions with respect to distance education. The enemies, however, are difficult to spot and may disguise as a supposedly ideological bias in favor of “high quality” or as buzzwords such as “leadership”, “entrepreneurship” or “innovation”. This, in a nutshell, was the message conveyed by Prof. Frederic Litto as he lectured to a crowd of research fellows, professors and journalists attending the “e-education” session this Friday morning at the IV BELIEF International Symposium at the School of Engineering, USP. 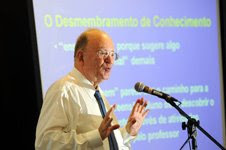 Litto is the President of the Brazilian Distance Education Association (ABED) and built a reputation as one of the pioneering founding fathers of e-learning and other ICT-mediated learning projects in Brazil, such as the “School of the Future” at USP. Sporting great humor as he listed the legacy of “bachelorism” in this country (mindframe of the elite who historically favored bachelors diplomas - especially in Law Schools - as a status or token of authority rather than authentic educational strategies from the very early periods of colonial development), Litto compared the late creation of authentic universities in Brazil (early 30’s of the 20th century) to the more enlightened strategies adopted by the dominant elites in the US and other Latin American countries, stressing his own personal difficulties at USP after almost 40 years of teaching, research and consulting. Buzzwords such as “innovation” or “leadership” usually mask the underlying conservative ethos of the elite. “How can one require innovation and leadership from the youth when, as a matter of fact, resistance to change and individual conformance are effectively rewarded in the long term?”, he asked. Litto favors not only a fuller and richer appropriation of existing e-infrastructures for education and lifelong learning but also a totally emancipatory mindframe for the individuals willing to engage with knowledge creation and educational discovery – not only within the restricted space of classrooms or geared towards your average, traditional student. “People now discuss `followership` rather than leadership. After all, if everyone is trained or expected to be a leader, there will be no followers, no Indians for the shaman to inspire or cure”, Litto said, while stressing that digital infrastructures are maturing to the point of enabling the development of “personal learning environments”. The very existence of a Minisrty of Education was criticized – every thing is from the start supposed to be fiercely and continuously regulated, a paradise for lawyers, but hell for teachers and school managers, always passively awaiting the next decree, the latest prohibition. “When we enter the universe of digital infrastructures, it should be prohibited to prohibit”, insisted Litto, echoing the well known lyrics of Caetano Veloso, a prominent Brazilian singer who led the “tropicalist” cultural revolution in the 60s. Litto announced a coming paper on the obstacles to empowerment and sustainable creativity in the Brazilian educational system and warned for the risk of a country with such huge challenges lagging behind other developing economies. Among other provocative thoughts about the very philosophy of education now prevailing at schools, regulatory agencies and faculties of education, Litto acknowledged the importance of entertaining educational practices (or “edutainment”), an emerging area prone to the convergence of videogame and digital cultural patterns with fast and multiplexed interfaces for active and engaging learning experiences. “I was null at math, until I had the chance to watch animations and thus enthuse with math and science”, Litto said, adding that the new digital TV standard is very likely to have a negligible effect on education as long as image quality is ranked above multiple channels for educational interactions in the industrial and regulatory framework of the newborn Brazilian digital TV standard. Last, but not least, Litto, a US native married to a Brazilian who decided to become a resident out of love for the country and her people, insisted on the importance of e-infrastructures with respect to more effective and encompassing language learning practices. “In the US, during the Cold War, a special project for language learning set forth numerous language learning programs so as to support engagements in Arabic, Spanish and other languages. We should also treat language as a war platform, not to conquer, but to further promote social, gender and ethnic inclusion in Brazil”, he stressed. “I am not for race and quotas, but I do support affirmative action and firmly believe that e-infrastructures are yet to come in nicely as a helping educational strategy if we want to one day overcome the awful legacy of an elite of bachelors who for centuries made discourses about enlightenment and moral authority while postponing the abolition of a long lasting slavery system in Brazil”, he concluded. Frederic Litto, a knowledge warrior, made a strong impression and contributed with a sound and inspiring message for all those committed to e-education on the grid. Gilson Schwartz, Brazil Coordinator, PRO-IDEAL Consortium (www.pro-ideal.eu) in collaboration with Sônia Barreto (Colabori Lab, School of Communication and Arts, USP) and Ezequiel Pordeus (City of Knowledge Research Group, USP Learning with Culture and Extension Program, Pro-Rectorate of Culture and Extension, USP).